The Porsche 968 was the final chapter of the long line of front engine Porsche sports car that started in 1976 with the 924. At the end of the front-engined water cooled era, the 911 was not dethroned, but the Harm Lagaay designed 968 coupe & convertible gave it a run for its money. In the world of used front-engined Porsches, the 968 offers one of the best driving experiences for the cash. Find this 1992 Porsche 968 Convertible offered for $9,999 in Reno, NV via craigslist. Production of the 944 at the Audi factory (under contract for Porsche) in Neckarsulm ended in 1992 and Porsche 968 production commenced at the Porsche factory in Zuffenhausen. However, the 968 was really a continuation of the 944 with components and technology moving to the new chassis. The 968 didn't sell very well due to various reasons, with less than 5000 shipping to North American from 1992 to 1995. The 968 was only available in the USA with one engine option -- the 3.0 liter dual-over-head-cam 16V inline-4 (an evolution of the 3 liter 944S2 engine) that produced 240 horsepower. The power rating might seem low compared to today's direct injected monsters, but a similar vintage 911 only put 247 horsepower out of its 3.6 liter flat-6 -- and the 968 had one more gear in its 6-speed box. The 968 offered 2+2 seating on the inside but only small children (or leg-less adults) should ever be shoved into the rear seats. The front seats, however, have plenty of room to store your spare Ducati motorcycle body. Gorgeous and fabulous to drive. But this is not the car you were looking for (Get it - a Star Wars reference? White paint looks like a storm trooper? No? Nothing? Don't worry, I'm here all week. Try the veal. ), unfortunately. Typos and description aside, it's clearly been abused and those chromed wheels tell the whole sordid tale. This is a run don't walk away example. You should buy the best 944/968 that you can afford or it's gonna empty your bank account. Starting with cars like this 1995 with 42K miles and 1994 with 70K would be a good idea of what these cars need to be. Seriously, storing your motorcycle in your Porsche convertible, and leaving it there for the pictures? I have even deeper concerns that K2. 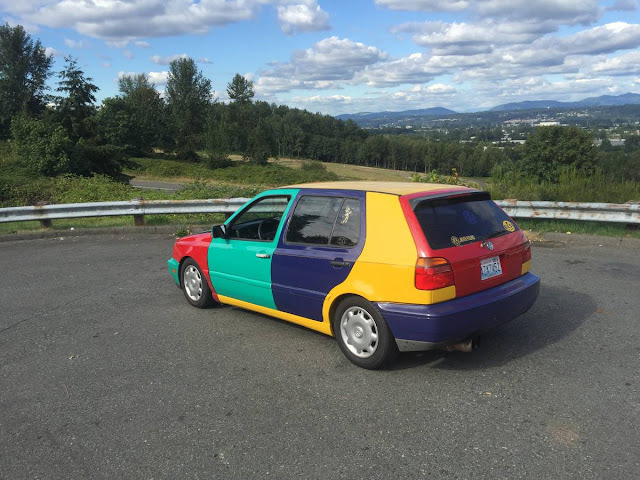 It seems like this car either does not run, or does not have a reverse gear, since the seller could not get it out of the garage to take photos. But at least the parking brake must work: the guy has plenty of lumber stored under the car but is NOT using the ubiquitous 2X4 as a chock. There was a black one of these for sale here for $8500 last summer/fall. Iirc it was a coupe with 58k km and her mint. Knowing what it was and its rarity I wanted it but as usual limited funds Mame purchases impossible. This is one of those cars that IS rare, yet simultaneously isn't. It will most likely never be worth big money, either, mainly because of the cylinder count. Which is a shame, but also an opportunity for the savvy enthusiast. The best of the best would be the 1989 944S2 Cabriolet, with only 16 produced. Now that's rare. While not quite as quick as the 968, this 944S2 is a spectacular car for sale for only $13K. The 562 production total for the 1991 MY, not (as I noted above) the 1989. K2 -- I think the 944 turbo (and 944 S2) might be a better collector car for the future, I just love the looks of the 968. Exposed pop-up headlights and the convertible trunk line are both perfect. But my tastes are a bit strange. I don't think your tastes are strange at all, Vince. I know a lot of folks would agree with you, including myself. I owned a 951 for a long time. People were always fawning over it. They are fantastic cars that deserve far better. But the market has spoken and they just...aren't collectibles. They're used cars with a small enthusiastic following, at best. That may change in the future, but I think it won't. Why would a gearhead 20 years from now want one when you can buy a Hellcat that will literally blow it out of the water and be far easier to get parts for? I think the Panamera will be the same as the 924/944/968 too, but that's another discussion entirely. That being said, I think a 944/968 bought wisely (never cheaply!) is a no-lose proposition. I sold mine for more than I bought it for, but just barely. I'm also led to believe that the convertible is not the one you want, even if you want a convertible. I remember in era road tests lamenting how bad the wind buffeting was in the cockpit compared to other convertibles of the day. The wind buffeting was bad even in the couple version of the 924/944/968. I dont like to drive with the windows down in mine because of the whistle created by the airflow between the side mirrors and the A pillar. And forget taking the sun roof out--it will blow your ear drums out. That said, the coupe version of these cars is the way to go, much stiffer than the chopped convertibles. I'm always in the hunt for a really good 994s2 couple. Huh? I don't know what you guys are talking about. Was it loud with the windows down and the sunroof (the song and dance to get it out was always hilarious...Porsche liked to make us work for it, I think) off? Yes, but no more than any other car with a similar shape (i.e. hatchback-coupe). The convertible top was beautifully made by ASC and included a trip back and forth over the ocean for those cars. Surely they never made a profit for Porsche (Allante, anyone?). The additional structural bracing added weight, but was worth the effort and included fixed wing windows that also helped a lot with wind management. I am in agreement that these are not race cars, they're for touring in grand style. Another quirk that I always thought was ridiculously designed was the odometer reset button, which didn't work unless the key was turned in the ignition. Only my 164 was more indecipherable, but I found that to be quite entertaining to tell you the truth. I miss that car, too. Both cars were a ball to drive but not so much to maintain, which is why I still have neither. While both were tremendously reliable and I wouldn't have hesitated to drive either across the United States, the simplest parts cost double or triple what they should have.